I just realized recently that we lost our change pad last year at some point. It just occurred to me that we'd need to replace it--ha! So I made a new one this time, using some leftover Michael Miller Zoo print I had from making Sprout a baby blanket. Thought I'd share with you a quick little tutorial as well in case you wanted to make one for yourself or a gift. Once you've got all your pieces of fabric cut, pin them together near the edges with the fleece/batting sandwiched between vinyl & cotton. The good sides of both fabrics should be showing. Mark rounded corners by tracing a CD placed in each corner, then cut that off all three layers with your scissors or rotary cutter. Baste the three layers together about 3/16" from the edge. Fold up the pad three times (into eights or sixths, as you like) & determine how much ribbon will need to go around the pad when folded. Add 1" to that measurement, cut & melt the edges with a lighter/candle. Stitch the ribbon loop onto top edge of pad near corner, with the loop facing inward toward the pad. Keep your stitching to within a 1/4" of the edge so the bias binding will cover it up later. Sew bias binding on all the way around the pad using a zigzag or other decorative stitch. That's about it! The loop can be used to wrap around the pad & keep it folded or carry it on the way to the bathroom or hang it up if you've washed it, or to hang it somewhere in a public toilet. 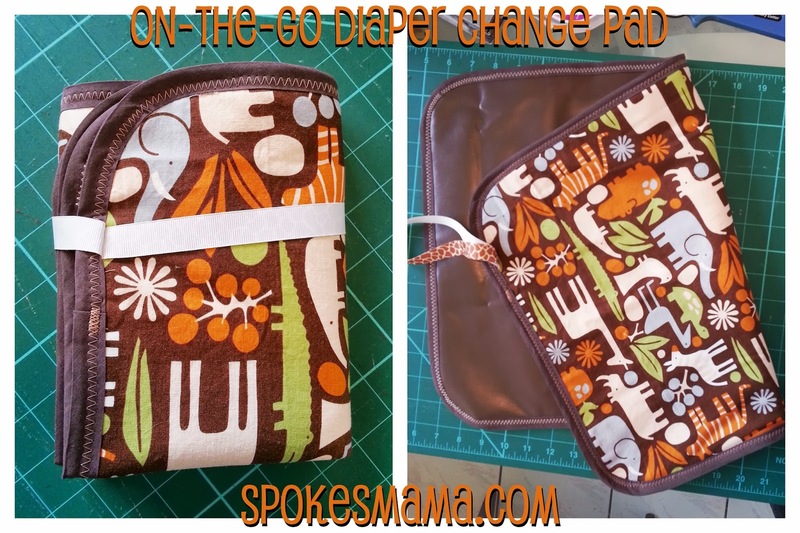 This pad is really basic & doesn't include extra fancy side pockets for diapers & wipes because we use cloth, so they're a bit bulkier & require a wet back to transport the dirty ones back home. We already have a good wet bag, which is where I store the wipes, diaper & folded change pad anyway. If you use disposables, this diaper clutch tutorial on AllFreeSewing might appeal to you. Let me know if you make one & what you think of the tutorial--I'd love your feedback!